As opposed to the effort to detect counterfeit coins, new security features added to the currency paper makes it easier to detect counterfeits. First, examine the currency and compare the note you are questioning to one of the same denomination and series (date with possible letter added). Look at the quality of the paper and the sharpness of the printing. Look for how the note differs from the genuine note. If the printing looks flat, darker, the colors do not look the same, and does not show the fine details that the original, you should check further. Look at the Federal Reserve and Treasury seals. On a genuine note, the saw-tooth points are clear, distinct, and share. Counterfeit notes may be uneven, rounded, or even broken. The boarder should be clear and sharp, even on a worn bill. The portrait should appear distinct from the background. If it looks like it is blending into the background, the note is likely counterfeit. One of the tricks the counterfeiters use is to change the denomination in the corners hoping that they can pass the note to someone not paying attention. The most common alteration is changing a $1 note to look like a $10 bill by changing the numbers in the corners to be tens. You would be surprised how many times this works! 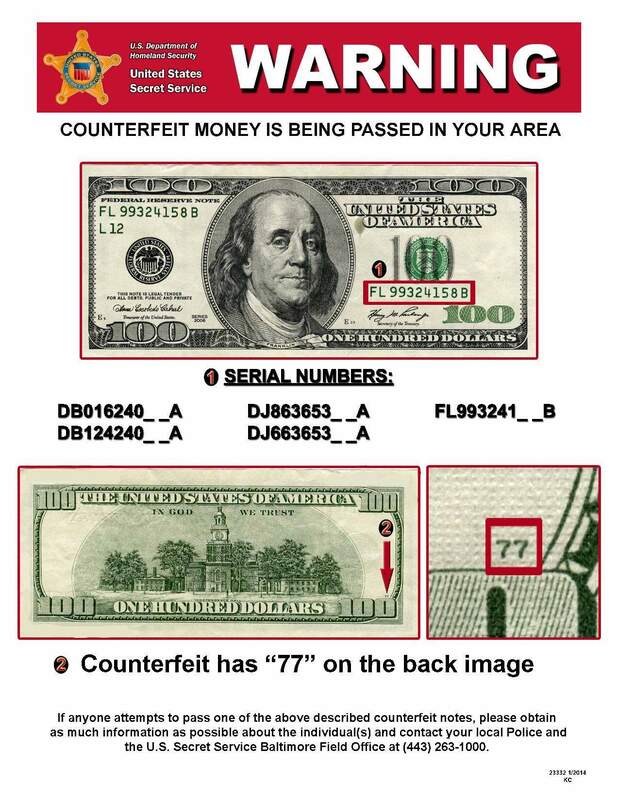 Counterfeit Currency Warning issued by the Baltimore Field office of the U.S. Secret Service in 2014. Genuine currency paper has a distinct feel that is different from writing paper. Currency paper is primarily made from cotton with tiny red and blue silk fibers embedded in the paper. Counterfeiters will try to simulate this feature by printing red and blue lines on their paper. You can see the difference between embedded threads and printed lines using a magnifying glass. One thing counterfeiters do is to try to print or copy genuine notes on paper that they bleached to remove the printing from a lower denomination. Bleaching will dull the security features but not eliminate them. Counterfeiters count on you not understanding the security features to pass the note. First, look for the watermark. Every new note except to the $1 bill has a watermark of the portrait on the front of the bill. Hold the note up to the light and look for the watermark. You should be able to recognize the portrait as being the same portrait as printed on the note. If you are looking at a $20 bill, you should see the portrait of Andrew Jackson. If the watermark portrait is unclear, missing, or does not look like Jackson, you have a counterfeit note. If the watermark is the number “5” the paper is from a $5 bill and was reprinted by a counterfeiter. Also look for the security thread that may be running up and down to the left or right of the portrait. The security thread should say “USA” and the denomination repeating on the thread. If you are looking at a $100 note and the denomination on the thread says “FIVE” then you are looking at a bleached counterfeit. Every time I visit a store and watch as the cashier use one of these currency pens to try to detect if I passed a counterfeit note, I laugh because it is not a dependable test. The counterfeit detection pens use an iodine-based ink that writes in yellow or are colorless. If the ink darkens, the bill is allegedly a counterfeit note. The principle is that the iodine ink will react with the natural starches in regular paper. Since currency paper is made from cotton, it does not have these starches and will not react with the iodine-based ink. If you are trying to pass a bleached note, the ink will not react since it is real currency paper. If you are trying to pass an altered note, the ink will not react since it is real currency paper. You can also make a genuine note look like a counterfeit by spraying starch that you would use to iron shirts on the note. Spray the starch on the note and use a warm iron get it to stick to the note. When you try to use the note and the cashier uses a counterfeit detection pen, the ink will change colors and you will be accused of trying to pass a counterfeit note. The only way to reliably detect counterfeit currency is using the embedded security features. 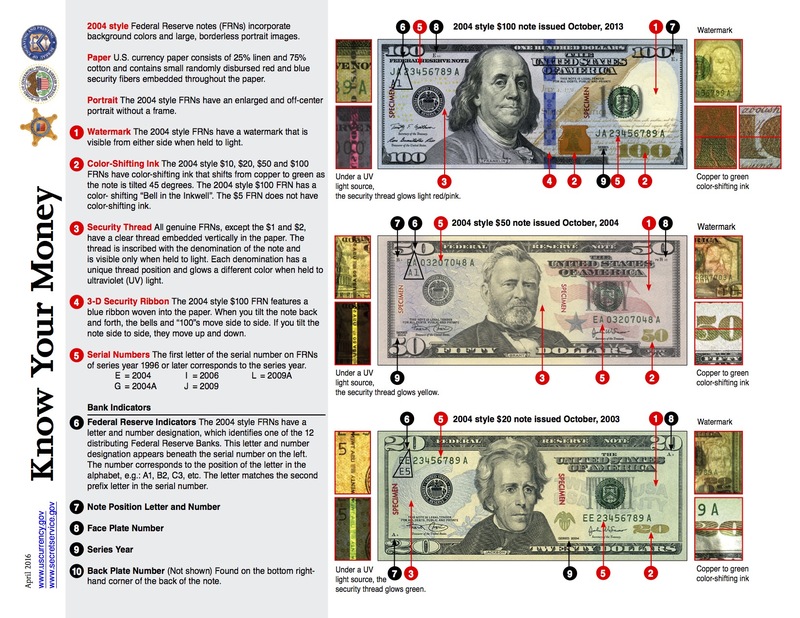 To learn more about detecting counterfeit currency, the U.S. Secret Service and the Bureau of Engraving and Printing created the U.S. Currency Education Program to raise awareness about how to use the design and security features of U.S. currency. You can find a lot of resources at uscurrency.gov including an online training module that you can download for a reference. If you receive a counterfeit note, do not return it to the person who gave it to you. Gather as much information as you can such as the description of the person, the description of anyone with that person, license plate and make of the car they might be driving, and call the police or contact your local U.S. Secret Service field office. Try not to handle the note. Rather, put it in something to protect it, like an envelope and give it to the police when they arrive to investigate. Remember, in the United States it is illegal to posses counterfeit notes that are not marked as counterfeit or defaced in a way that make is clear the note is note genuine. Finally, in the last installment we discuss resources you can use if you do not trust your own judgement. Information images courtesy of the U.S. Secret Service. Counterfeit detection pen image courtesy of Bulk Bar Products.